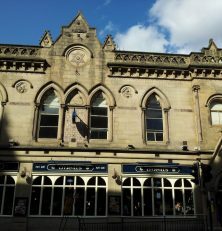 Better a pub than a Masonic hall? Though many exist further out, O’Neill’s is surprisingly the only Irish pub in the city centre. Staffed by and catering to many expats, it offers traditional Irish breakfasts, traditional Irish beers, and traditional live Irish music on Friday and Saturday nights. 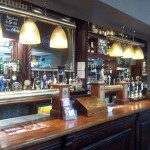 A chain pub, it very much has a chain feel in terms of food menus, drinks selection and decor. The bar looks a lot like the bar in every other chain pub. 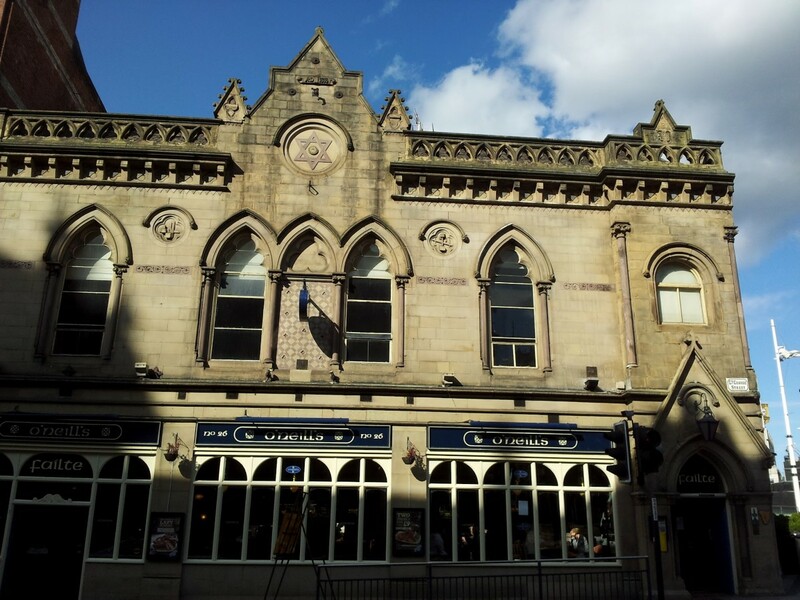 Built in 1865 as a Masonic hall, the exterior embellishments make this listed building an interesting piece of architecture. The interior space is massive, with a full upstairs and many individual rooms with plenty of tables and chairs. 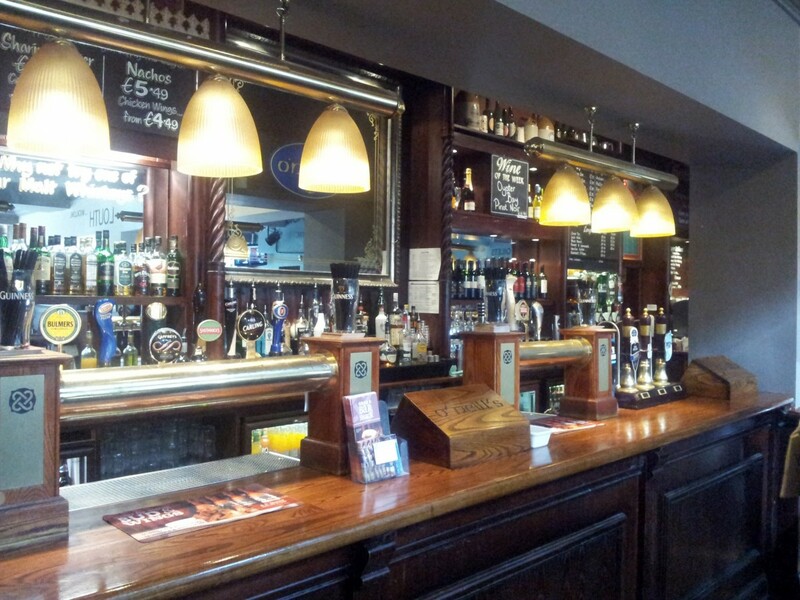 Their large menu features Irish classics and other pub food, with decent value and portion sizes. 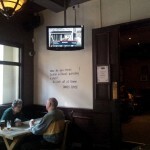 The many TVs were a turn-off for us, but would appeal to those wanting to catch some live sport, and a sandwich board outside even promises broadcasts of Gaelic football and hurling. 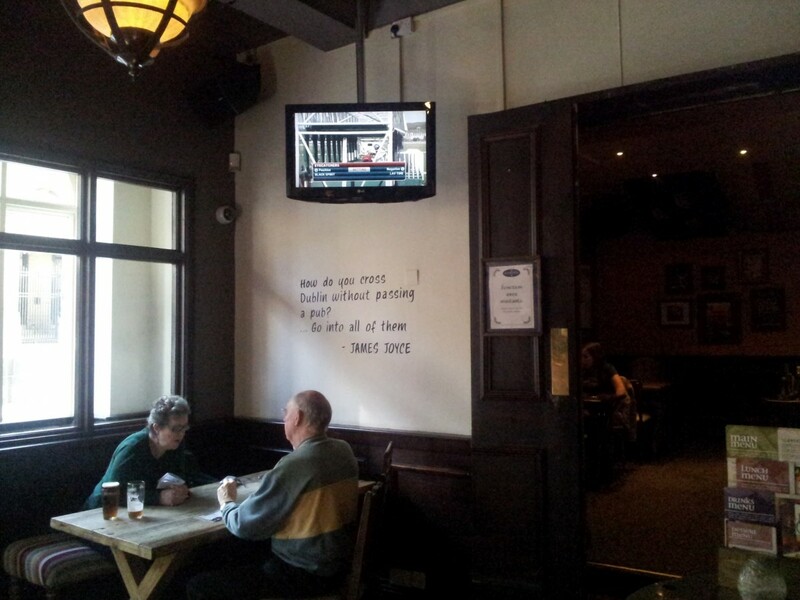 Sports and James Joyce quotes. Of course. While the atmosphere is comfortable, O’Neill’s disappointed us in their beer selection. In addition to Guinness, Caffrey’s and Smithwick’s on draught, they had just three hand-pulled local ales (and one of those taps was off when we visited). Beyond that, their bottle selection is poor, with Peroni and Tiger being the only lagers we would find remotely palatable. So while this is a good spot to visit if you’ve got a hankering for an Irish breakfast or sausages & colcannon, you should keep moving if you’re in search of an interesting pint. Most Brits who haven’t been to Dublin don’t know what good Guinness tastes like, and therefore aren’t aware 99% of bars don’t serve good Guinness. O’Neill’s, for all its faults, keeps it to a reasonable standard, if not perfect. For Leeds that counts as exceptional. I also noticed a couple of decent cask ales. The place is reasonable to dive into if you’re wanting an update on sports events but otherwise it is another clone inauthentic characterless pub, even with the gaelic football shirts and Irish ephemera. Not wanting to nit pick but these aren’t ‘traditional Irish pubs’, they are Irish themed pubs. When these places first popped up in the early 90’s I paid my first visit to Ireland and realised they bore no resemblance at all to real Irish bars.